Some things are meant to go together like spoon and fork, milk and cookies, father and son, and of course cheese burger and bacon. Talking what goes with what, I remember my father and his ultimate favor for all things made of bacon. Then there's my brother and and his terrible appetite on all types of burger. They always argue abut life, practically and things that should go together to achieve some worth. These two men in our family have ideals that are worlds apart but when comes to faith and service to the Lord they are in unison. Food, particularly hamburgers, also knit them more closely. My brother could not be as much like my father but I know something both of them would agree on, the Son of Baconator being made to it’s father's image and likeness, the Baconator. The Son of Baconator—the youngest among Wendy's mouthwatering hamburger line—is fast becoming the "it" burger in town today. Perfectly made for a small appetite person, but bursting with a big taste from a premium burger. With all these in mind, here’s a little trivia for you. Touted as Wendy’s best burger during its launch last 2008, the Baconator has two quarter pound beef patties, each topped with a slice of cheese. Before being slathered with ketchup and mayo, this appetite booster will tantalize you with six slices of bacon. Then all sandwiched with sliced freshly baked sesame- seeded bun. A chip off the old block should I say, introducing the new Wendy’s Son of Baconator! A mouthful, like his father but specially made for the lesser meat eater but still looks for the same Baconator taste. It has two 45 grams of 100% pure beef patty, 2 slices of American Cheese and 4 strips of tasty, freshly cooked, delicious Bacon with Mayo and ketchup on all toasted Kaiser buns. Just like its father, the Baconator , The Son have that flavour that is out of this world. The classic all-American comfort food, packed with beefy goodness where the cheese slices blanket the patties then slammed with the rich pork flavour, that has to be pronounced, which is almost sweet. In these burger sandwich, the bacon tasted almost maple-y and bordered on slightly too sweet and too salty, but the whole combination was heady and gluttonous in the best possible way. The bacon that’s meant to be savoured, which happened to be generously slid in layers of Wendy’s original beef patties and cheeses. The Son of Baconator has all the delicious elements of the mouth-watering Baconator has, a definite look alike,featuring the all-American staples, burger sandwich and bacon. The Son of Baconator will only be available on June 4, 2012 until August 5, 2012. 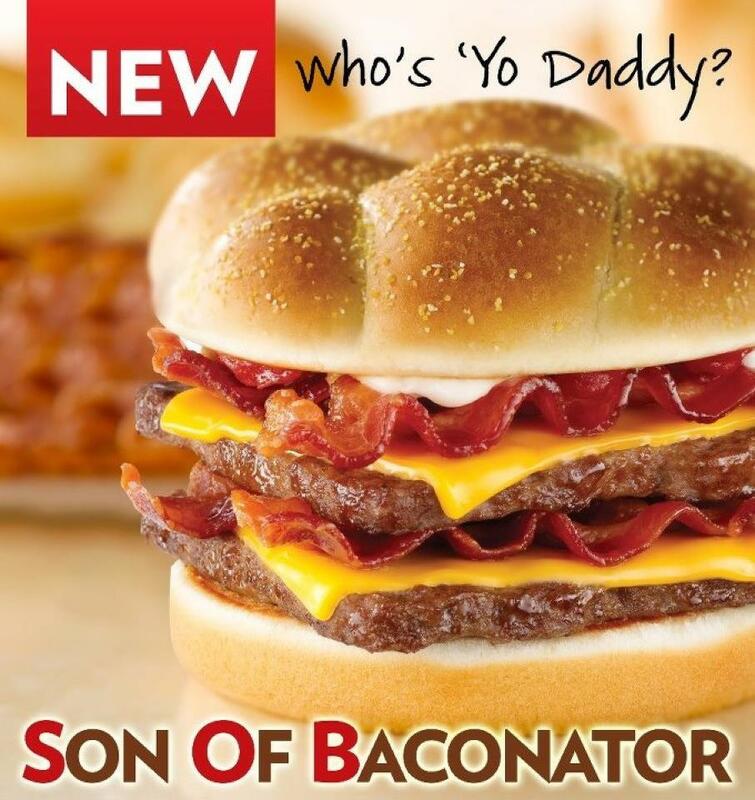 Last June 17, 2012 , Wendy’s introduced the Son of Baconator for the month-long Father’s Day celebration. Photobooths were assembled for Free Photo Shoots between fathers and sons in selected branches in the metro such as Wendy's Festival Mall, Wendy's Glorietta, Wendy's Robinson Ermita, Wendy's Megamall, Wendy's MOA and Wendy's SM Annex. Coinciding with these free photo booths is a contest showcasing the Best Father and Son Look-Alike which were held last June 17, 23, 24 and 30. It was a fun-filled opportunity to show –off candid poses from the customers who purchased the Son of Baconator Burger at the said branches which is only P 150 or with a full meal combo with drinks and fries for P190.00. New on their menu, Chocolate Chip and Chocolate chip Oatmeal Cookies, Blueberry Muffins. Flavorful Brew, the leading Italian roasted coffee, for only P50 per cup. And the newest addition to their dessert menu, the twisted Frosties, in everybodies' favorite chocolates, Kitkat and Oreo. So, can't wait to run for these? I'm sure there's one branch nearest you, so what are you waiting for? Man, I just love the Baconator! Can't have enough of it! It was a good move to have a son of baconator for those who can't have an appetite that can gobble up a baconator. I also like that they added Lavazza coffee for P50 since this is my favorite coffee. Wendy's is best for it's salad before. And the burgers, specially the bacon cheeseburger is of high quality. I wonder Wendy's branches are getting fewer and fewer. I prefer Wendy's over McDo. I've tried the son of baconator is I loved it. But the new line of frosty I haven't tried them. Will check out soon! I like Wendy's but so expensive naman! 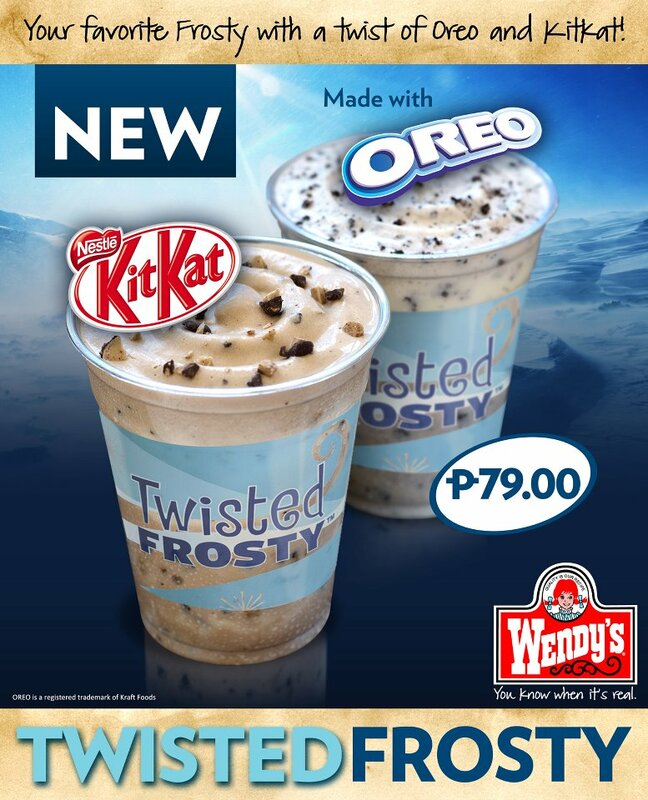 That Baconator looks really yummy, will try that soon as well as the new frosties..I love their frosty!! I wish I got the chance to taste the above posted foods. Pretty cool!